The success of United Way is based on the people and organizations throughout Berks County who have adopted the LIVE UNITED mindset. Penske Truck Leasing is a company that shares the Live United message all year long, and it is evident through their success in supporting the annual United Way campaign: the dedicated team at Penske has raised more than $1 million in each of the last three years, a remarkable achievement unmatched in Berks County. The 40 person committee engages employees in United Way’s work year-round by creating a “United Way at Work” calendar, which they share with their 1,500 fellow employees. The robust calendar is filled with at least one United Way focused opportunity each month, while some months consist of up to three events. The big event for the month of March is the Easter Basket Drive, which benefits the Olivet Boys & Girls Club. 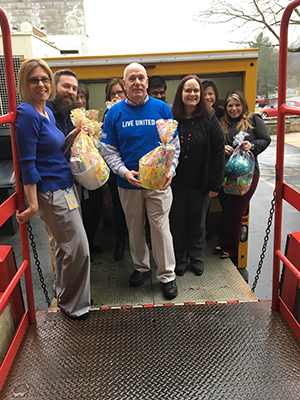 This tradition has been happening for 18 years, and it provides all of the departments the opportunity to get together and help the community by supporting the United Way of Berks County Partner Agency. The commitment of the committee is evident through the dedication to assure the drive is successful. On a recent cold and rainy morning, members of the committee gathered to transport 306 Easter baskets to Olivet Boys and Girls Oakbrook Club. The committee formed an assembly line to transport the baskets from the building to the Penske truck. At the front of the line was the Committee Co-Chair Kelly Fessler. Kelly has been a part of the committee since 2015 and is in the early months of her new role as Co-Chair. Fessler said, “I love being in this role because I get to see the work being done behind the scenes. 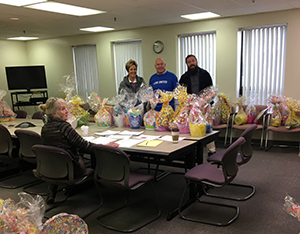 The Easter Basket drive is one of my favorite events of the year.” Once the truck was loaded committee members made their way to the club to deliver the baskets. When they arrived at the club they were greeted by eager Olivet staff members ready to unload the truck. Carly Jones, the Associate Director of Resource Development for Olivet Boys & Girls Club was awed by the generosity. “This is an amazing, and awesome, opportunity for the kids because some of them may not otherwise be receiving any holiday treats,” she said. The baskets were divided among the seven clubs to be distributed to the children at each club’s Spring Holiday party. Lisa Schultz, a United Way at Work committee member for over 20 years and also a Ready.Set.READ! Star Readers Tutor, sees the Easter Basket project as a way to give a little something special to children in need. “As a mother of four, I love working with opportunities with, or for, kids,” she said. Within the first quarter of 2018, the Penske team has already participated in four United Way at Work activities and there are more to come. They plan to continue their success by attending the upcoming Campaign Planning Workshops to help them plan their 2018 company campaign and to continue spreading the United Way message.